Dress as the ultimate Sith Lord in this Darth Vader costume for boys. 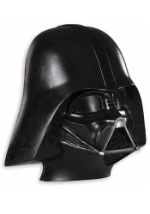 The Darth Vader cape and mask set includes a black cape that measures 38" in length and a half plastic character mask. Set your Darth Vader costume apart from the others when you add our coordinating lightsaber and gloves!